Brilliant trip. Our guide was Lynn I think, very good value, interesting funny. Loved the museum and the little taverna. Brought some honey - very good value and loved the wine. Need I say more! We have just got back from a week in Alaykanas and the highlight of our week was a trip on the little train. Brenda is an amazing and funny guide and Spiros is so cute! His passion for the island is infectious and seeing all his hard work in the museum was amazing and very humbling. If you are going to Zante you must go on this trip. It was 12.5 euros and worth every single penny ( euro ) You can book your tickets at Jammys in Alaykaynas but we also just turned up and managed to get on. Have fun!! 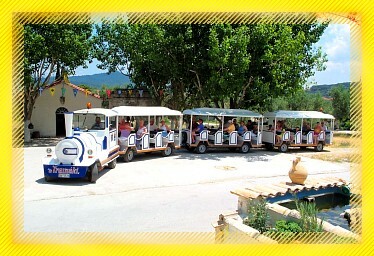 we are going in august for a week and this train sounds like fun we are sure to try it especially the wine!!!!!! Great little trip and didn't break the bank.We took a three month old and a three year old and they both found it enjoyable. Nice little stop at a taverna with really nice food!! Really enjoyed this trip! it's a must! it's not just a ride on a train, it's so interesting and fun! and my God there's not much of that in the world today. Thank you to Brenda and Spiros money well spent. Oh and by the way Brenda..... the Holy water didn't work for me i didn't wake up the next day 6 foot and Handsome Thanks again! One of the best trips out I have ever had in Greece! The museum is fascinating ( and amazing when you think that Spiros has done it all himself, no sponsorship or government money). The countryside is so lovely, the little church at Pigadakia is interesting and the hospitality at Spiros taverna is overwhelming (you really do have to keep refusing more wine). Spiros himself is a truly kind man, as I found out when my camera ran out of film. "No problem", he said, and when we got to the church and taverna he put me into his own car and took me up to the supermarket in the middle of the village, waited while I bought a new film then took me back to the taverna. He wouldnt even take a couple of euros for the petrol. Thats the kind of thing that just doesnt happen in the UK. By the way, you can buy your ticket at the train/excursion office opposite Montes supermarket in Alykes main street, and I think theres another one in Alykanas main street. Hi you used to be able to book at the Jam in bar, not sure if this has changed but im sure you can. I will probably be speaking to the lady who runs it soon so if it has changed i will keep you updated. Thanks for your help Hayley. Do you happen to know if there is somewhere in Alykanas to book the trip as I am sure we booked it from there last time. If not, it is no big deal walking up to Alykes to book. I went on the tourist train a few years ago and really enjoyed it. We are going back to Alykanas this year, but cannot remember where you book this from? Also, how do you go about booking the greek night as we did not go on it last time we were there. Hi to everyone off the train, i cannot recommed this trip enough and the greek night, we have been numerous times as our friends work on the train and Dave works in the restaurant! It is a brilliant experiance which gets better each year. I'd love to say im going to be back next year but i am 12 weeks pregnant and am not going to be able to get over until 2009 which i am gutted about however i know our baby will love every second as my friends off the train will make every minute special as they always do. I hope you are reading this avril and i cannot wait to see you and dave again even though it is going to be a while. For anyone who was in Alikanas or Alykes on Wednesday 26 September they should know how much i enjoyed the train ride. We made sure everyone heard us or waved and we were very loud!! About 17 regulars from the Iris Bar went on the train to the museum, church and the Taverna and it was the best day out EVER!!!! Nice to find out some history about the villages and the island and use one of the funniest toilets you'll use (always helps to take someone to hold it on a breezy day!!!!!! those who have visited will know what i mean!!). You must have the Pork Souvlaki Plate at the taverna its fantastic and only 6 euro and you'll need something to absorb the wine - it does make you into a giggling, cheering, singing idiot - but thats what its all about going and having a fun time. Excellent day which must be sampled at least once or more if your liver can handle it!! Make sure you wave to the locals if they come out to wave - no-one thinks its silly!!!! The train trip is a must for everyone, take time and find out if you are staying in alykes or alykanas about this trip its fantastic and the guides are great, brenda is really great fun and makes the trip interesting for all ages... Watch out for the village wine as per other comments it makes you become a giggling idiot or a giddy kipper!!!!! 2. You can buy a ticket for the best Greek night in town. Watch out for the wine - it turns you into a giggling idiot. Have been on the trip a few times but this year was the 1st time to the Greek Night on saturday night. What a brilliant time had by all in the party. We were all up dancing and joining in. I have been to a few Greek Nights in my time but this has got to be one of the best and I really do recomend it for people. Spiros is lovely and makes you feel very welcome. My Neices boyfriend got very taken with the red wine and was talking to a Scottish Gentleman sitting opposite us about this and the next thing we knew was that Spiros placed 2 bottles of wine in front of him to take home "on the house". This really made his day. On the way back to Alykes everyone was singing on the train and everytime we went past bars everyone was waving to us. All in all an excellent night out and would most definitley do it again. I've been to Alykanas about 18 times but only went on this trip for the first time last year, it's a good, fun outing. Say Hi to Brenda from me! We went on the Tourist Train twice, once for the sightseeing trip which was lovely and the museum was really interesting. Then we went to the Greek Night on the Saturday which was a hoot, lots of drinking, eating, dancing, plate-smashing, fire hopping ang general tipsy fun! We had a great time and Spiros was lovely, I have never seen someone with such a permanent smiley face!! I would definitely do it all again, 10/10!! Got back from Alykanas on 27th May after a wonderful week away without the kids. Went on the Trainaki with my boyfriend who hadnt been before, he pulled a face when he first got on it as he had to wave to people as we went past but he soon got the hang of it and actually enjoyed himself. We went to the taverna where we were plied with wine, well i was as he didnt drink and complained there was no orange juice....MEN!! We are hoping to go back very soon, its a good trip out and would highly recommend it.